The following is an excerpt from She Has Her Mother’s Laugh: The Powers, Perversions, and Potential of Heredity by Carl Zimmer. The worst scares of my life have usually come in unfamiliar places. I still panic a bit when I remember traveling into a Sumatran jungle only to discover my brother, Ben, had dengue fever. I lose a bit of breath any time I think about a night in Bujumbura when a friend and I got mugged. My fingers still curl when I recall a fossil-mad paleontologist leading me to the slick mossy edge of a Newfoundland cliff in search of Precambrian life. But the greatest scare of all, the one that made the world suddenly unfamiliar, swept over me while I was sitting with my wife, Grace, in the comfort of an obstetrician’s office. Grace was pregnant with our first child, and our obstetrician had insisted we meet with a genetics counselor. We didn’t see the point. We felt untroubled in being carried along into the future, wherever we might end up. We knew Grace had a second heartbeat inside her, a healthy one, and that seemed enough to know. We didn’t even want to find out if the baby was a girl or a boy. We would just debate names in two columns: Liam or Henry, Charlotte or Catherine. Still, our doctor insisted. And so one afternoon we went to an office in lower Manhattan, where we sat down with a middle-aged woman, perhaps a decade older than us. She was cheerful and clear, talking about our child’s health beyond what the thrum of a heartbeat could tell us. We were politely cool, wanting to end this appointment as soon as possible. We agreed that we’d deal with whatever challenges our child faced. I felt proud of my commitment. But now, when I look back at my younger self, I’m not so impressed. I didn’t know anything at the time about what it’s actually like raising a child with Down syndrome. A few years later, I would get to know some parents who were doing just that. Through them, I would get a glimpse of that life: of round after round of heart surgeries, of the struggle to teach children how to behave with outsiders, of the worries about a child’s future after one’s own death. But as we sat that day with our genetics counselor, I was still blithe, still confident. The counselor could tell we didn’t want to be there, but she managed to keep the conversation alive. Down syndrome was not the only thing expectant parents should think about, she said. It was possible that the two of us carried genetic variations that we could pass down to our child, causing other disorders. The counselor took out a piece of paper and drew a family tree, to show us how genes were inherited. “You don’t have to explain all that to us,” I assured her. After all, I wrote about things like genes for a living. I didn’t need a high school lecture. The “entire human genome” that Clinton was hailing didn’t come from any single person on Earth. It was an error-ridden draft, a collage of genetic material pieced together from a mix of people. And it had cost $3 billion. Rough as it was, however, its completion was a milestone in the history of science. A rough map is far better than no map at all. Scientists began to compare the human genome to the genomes of other species, in order to learn on a molecular level how we evolved from common ancestors. They could examine the twenty thousand–odd genes that encode human proteins, one at a time, to learn about how they helped make a human and how they helped make us sick. In 2001, Grace and I couldn’t expect to see the genome of our child, to examine in fine detail how our DNA combined into a new person. We might as well have imagined buying a nuclear submarine. Instead, our genetics counselor performed a kind of verbal genome sequencing. She asked us about our families. The stories we told her gave her hints about whether mutations lurked in our chromosomes that might mix into dangerous possibilities in our child. Grace’s story was quick: Irish, through and through. Her ancestors had arrived in the United States in the early twentieth century, from Galway on one side, Kerry and Derry on the other. My story, as far as I understood it, was a muddle. My father was Jewish, and his family had come from eastern Europe in the late 1800s. Since Zimmer was German, I assumed he must have some German ancestry, too. My mother’s family was mostly English with some German mixed in, and possibly some Irish—although a bizarre family story clattered down through the generations that our ancestor who claimed to be Irish was actually Welsh, because no one would want to admit to being Welsh. Oh, I added, someone on my mother’s side of the family had definitely come over on the Mayflower. I was under the impression that he fell off the ship and had to get fished out of the Atlantic. What did I really know about the people who had come before me? …The more we talked about our genes, the more alien they felt to me. My mutations seemed to flicker in my DNA like red warning lights. Our counselor explained that my Jewish ancestry might raise the possibility of Tay-Sachs disease, a nerve-destroying disorder caused by inheriting two mutant copies of a gene called HEXA. The fact that my mother wasn’t Jewish lowered the odds that I had the mutation. And even if I did, Grace’s Irish ancestry probably meant we had nothing to worry about. The more we talked about our genes, the more alien they felt to me. My mutations seemed to flicker in my DNA like red warning lights. Maybe one of the lights was on a copy of my HEXA gene. Maybe I had others in genes that scientists had yet to name, but could still wreak havoc on our child. I had willingly become a conduit for heredity, allowing the biological past to make its way into the future. And yet I had no idea of what I was passing on. Our counselor kept trying to flush out clues. Did any relatives die of cancer? What kind? How old were they? Anyone have a stroke? I tried to build a medical pedigree for her, but all I could recall were secondhand stories. I recalled William Zimmer, my father’s father, who died in his forties from a heart attack—I think a heart attack? But didn’t an old cousin once tell me about rumors of overwork and despair? His wife, my grandmother, died of some kind of cancer, I knew. Was it her ovaries, or her lymph nodes? She had died years before I was born, and no one had wanted to burden me as a child with the oncological particulars. How, I wondered, could someone like me, with so little grasp of his own heredity, be permitted to have a child? It was then, in a panic, that I recalled an uncle I had never met. I didn’t even know he existed until I was a teenager. One day my mother told me about her brother, Harry, how she would visit Harry’s crib every morning to say hello. One morning, the crib was empty. The story left me flummoxed, outraged. It wouldn’t be until I was much older that I’d appreciate how doctors in the 1950s ordered parents to put children like Harry in a home and move on with their lives. I had no grasp of the awkward shame that would make those children all the more invisible. The counselor didn’t look worried as I spoke. That irritated me. She asked me if I knew anything about Harry’s condition. Was it fragile X? What did his hands and feet look like? “We would know,” she assured me. “How would we know?” I demanded. The counselor smiled with the steadiness of a diplomat meeting a dictator. “You’d be severely retarded,” she said. A few months later, Grace gave birth to our child, a girl as it turned out. We named her Charlotte. When I carried her out of the hospital in a baby seat, I couldn’t believe that we were being entrusted with this life. She didn’t display any sign of a hereditary disease. She grew and thrived. I looked for heredity’s prints on Charlotte’s clay. I inspected her face, aligning photos of her with snapshots of Grace as a baby. Sometimes I thought I could hear heredity. To my ear, at least, she has her mother’s laugh. Those thoughts led me to wonder about heredity itself. It is a word that we all know. Nobody needs an introduction to it, the way we might to meiosis or allele. We all feel like we’re on a first name basis with heredity. We use it to make sense of some of the most important parts of our lives. Yet it means many different things to us, which often don’t line up with each other. Heredity is why we’re like our ancestors. Heredity is the inheritance of a gift, or of a curse. Heredity defines us through our biological past. It also gives us a chance at immortality by extending heredity into the future. I began to dig into heredity’s history, and ended up in an underground palace. For millennia, humans have told stories about how the past gave rise to the present, how people resemble their parents—or, for some reason, do not. And yet no one used the word heredity as we do today before the 1700s. The modern concept of heredity, as a matter worthy of scientific investigation, didn’t gel for another century after that. Charles Darwin helped turn it into a scientific question, a question he did his best to answer. He failed spectacularly. In the early 1900s, the birth of genetics seemed to offer an answer at last. Gradually, people translated their old notions and values about heredity into a language of genes. As the technology for studying genes grew cheaper and faster, people became comfortable with examining their own DNA. They began to order genetic tests to link themselves to missing parents, to distant ancestors, to racial identities. Genes became the blessing and the curse that our ancestors bestowed on us. But very often genes cannot give us what we really want from heredity. Each of us carries an amalgam of fragments of DNA, stitched together from some of our many ancestors. Each piece has its own ancestry, traveling a different path back through human history. A particular fragment may sometimes be cause for worry, but most of our DNA influences who were are—our appearance, our height, our penchants—in inconceivably subtle ways. While we may expect too much from our inherited genes, we also don’t give heredity the full credit it’s due. We’ve come to define heredity purely as the genes that parents pass down to their children. But heredity continues within us, as a single cell gives rise to a pedigree of trillions of cells that make up our entire bodies. And if we want to say we inherit genes from our ancestors—using a word that once referred to kingdoms and estates—then we should consider the possibility that we inherit other things that matter greatly to our existence, from the microbes that swarm our bodies to the technology we use to make life more comfortable for ourselves. We should try to redefine the word heredity, to create a more generous definition that’s closer to nature than to our demands and fears. I woke up one bright September morning and hoisted Charlotte, now two months old, from her crib. As Grace caught up on her sleep, I carried Charlotte to the living room, trying to keep her quiet. She was irascible, and the only way I could calm her was to bounce her in my arms. To fill the morning hours, I kept the television on: the chatter of local news and celebrity trivia, the pleasant weather forecast, a passing report of a small fire in an office at the World Trade Center. Having been a father for all of two months had made me keenly aware of the ocean of words that surrounded my family. They flowed from our television and from the mouths of friends; they looked up from newspapers and leaped down from billboards. For now, Charlotte could not make sense of these words, but they were washing over her anyway, molding her developing brain to take on the capacity for language. She would inherit English from us, along with the genes in her cells. Charlotte’s fussing faded into sleepy comfort. She looked up at me and I down at her. I realized how consumed I had become with wondering what versions of DNA she might have inherited from me. I kept my arms folded tightly around her, wondering now what sort of world she was inheriting. 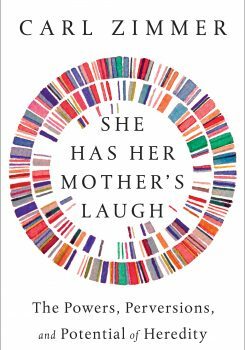 Excerpted from She Has Her Mother’s Laugh by Carl Zimmer. Copyright © 2018 by Carl Zimmer. Reprinted with permission of Dutton, an imprint of Penguin Publishing Group, a division of Penguin Random House, LLC. Carl Zimmer is the author of She Has Her Mother’s Laugh (Dutton, 2018). He’s also a science columnist for the New York Times. He’s based in New York, New York. Can Diet and Exercise Affect Your Genes? Researchers are examining how exercise, diet, and your environment play a role in gene expression. The story of how psychedelics are being used to treat depression, addiction, and even fear of death.